Amazon's new Kindle Fire HD undercuts the competition by presenting advertisements to users on both the device's lock screen and home screen, helping to subsidize its low price. Customers who buy a Kindle Fire HD will receive "special offers and sponsored screensavers" on the device. Amazon has said that the advertisements display on the lock screen and in the lower left-hand corner of the home screen, but they will not interrupt use of the device. The "Kindle with Special Offers & Sponsored Screensavers" is only available in the U.S., which makes international availability and pricing of the new Kindle Fire HD unclear. Advertisements presented on the Kindle Fire HD will include movie, music and book covers for upcoming titles. Customers will also be shown deals for digital content, such as top-rated Kindle books for $1, or $5 to spend on the Amazon MP3 store. Amazon also said it will offer customers discounted pricing on consumer electronics. One potential advertisement would be to save up to $500 on select HDTVs. Unlike with the e-ink-based Kindles, which allow customers to pay extra to remove advertising from their device, it does not appear that a "Without Special Orders" model of the Kindle Fire HD is available. At his company's press conference on Thursday, Amazon Chief Executive Jeff Bezos made a clear distinction between his company and Apple, noting that Amazon offers customers and makes money off of "services" rather than "gadgets." Amazon's intent with its Kindle hardware lineup is to push e-books and other digital  as well as physical  content sold through the online retailer. "People don't want gadgets anymore," Bezos said on Thursday. "They want services." Amazon's business model is of course very different from Apple, which achieves strong margins on its hardware sales, while executives have said that digital content sold through iTunes and the App Store is essentially a break-even business. While Amazon's hardware exists to sell goods, Apple uses apps, music and movies to enhance the ecosystem of its devices. On Friday, Wall Street analyst Shaw Wu with Sterne Agee said he's concerned about Amazon's low-margin business model. 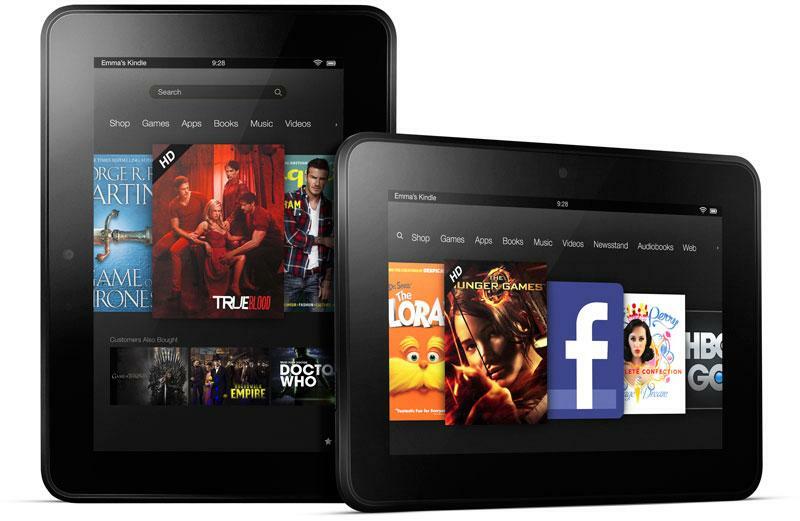 Last year, it was believed that Amazon was actually losing money on each first-generation Kindle Fire it sold. "We question the company's stance where it believes it can make profits on content is the right business model," Wu said, "as reselling someone else's content has historically proven to not be a very profitable venture."